I almost passed up this sketching opportunity as I hurried home from work but realized it was worth postponing dinner for and walked back. 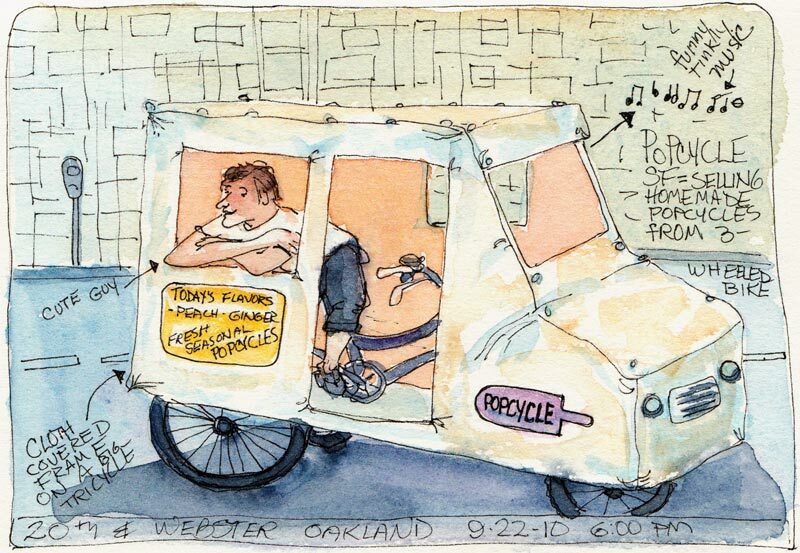 Here was this cute guy selling gourmet popsicles out of a pretend ice-cream truck that is really just a large tricyle inside a cloth-covered frame, playing rinky-tinky ice cream truck music. I asked the proprietor, David Meisenholder, if he would be there for a while so I could sketch him. He’d been about to leave but was nice enough to wait while I sketched him (and he even made a few more sales). The pretend, miniature “truck” is a brilliantly creative work of art, the kind of thing that makes your mind sort of expand and contract all at once, and is perfectly executed down to the little pretend headlights and grill on the front. This is a new venture for David and his partner; you can see photos of the Popcycle’s “Maiden Voyage” here and you can find his locations via Twitter. Fun sketch, Jana. You really do find them. What a great idea for the ice cream truck. He must have strong muscles to wheel it around. Now over to the SF blog. Too cute for words! Great sketch! Great that you turned around and made this cool sketch!! What an easily overlooked opportunity! What a unique subject! I’m glad you went back to sketch him! I love your sketch! You are so talented an very inspiring. What a nifty idea! I went and checked out their FB page and their pics. How creative are they!?! ?